In the summer of 2010 my cousin gave me a truck load of bricks. Feeling ambitious and with nothing better to do while camping for the weekend at my family’s private campground, I bought some mortar and started building a large brick oven designed to smoke meat. It took the entire summer to get the structure built with a number of family members pitching in to help me. Since then, I have sealed leaks and learned to vent it properly and have dialed it into a lean mean smokin’ machine. One of my favorite things to cook are bratwurst, the smoke ads an extra element of yummy and they‘re an easy product to cook in the smoke. 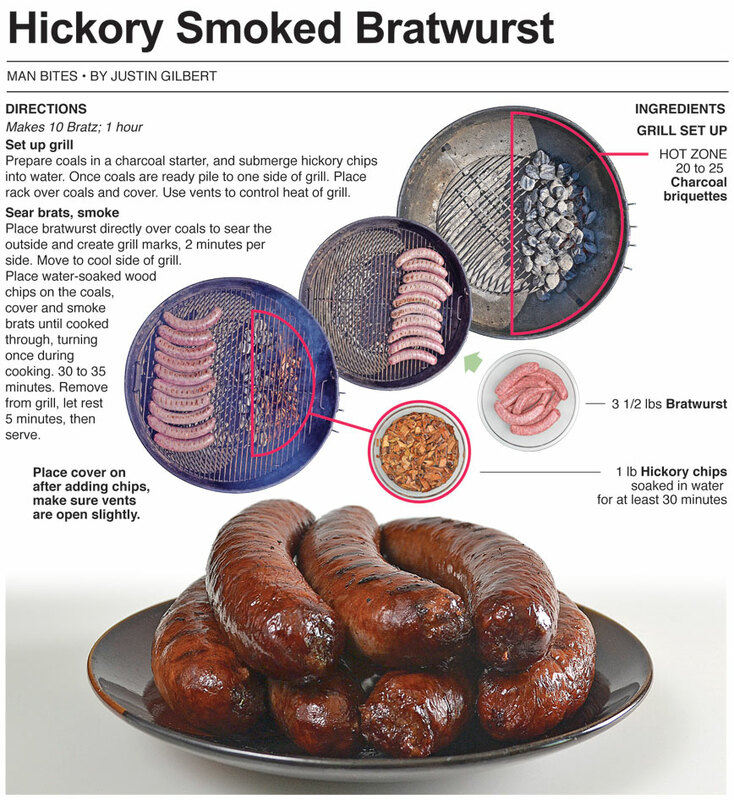 For this recipe, I turn my charcoal grill into a smoker to cook brats, because most people don’t have giant brick smokers readily available to cook on. It’s a simple technique that can be applied to any grill. The meat slow cooks over indirect heat as it soaks in the flavorful smoke. 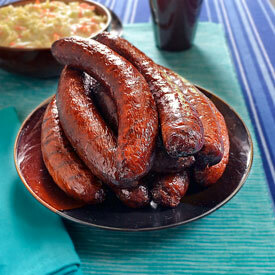 The end result is a juicy bratwurst loaded with smoky flavor. 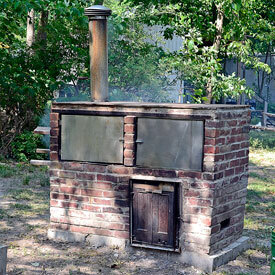 Although I finished the structure of the brick oven more than two years ago, it wasn’t until Memorial Day this year that I got it dialed in and working efficiently. I had always had trouble maintaining a good cooking temperature and it seemed like I had to stoke it like an iron smelter to keep the cooking chamber at 250°. My Uncle suggested I cover the vents built into the fire chamber (which I thought were necessary) to manage the heat better. I also sealed all the little cracks and put gaskets around the door openings. All of this combined to turn the oven into a great one-of-a-kind outdoor novelty that is fun and much easier to get a good product from. This past holiday weekend most of the family stayed at the camp ground and we were able to enjoy a number of smoked delicacies - Included a big batch of smoked bratwurst. Prepare coals in a charcoal starter, and submerge hickory chips into water. Once coals are ready pile to one side of grill. Place rack over coals and cover. Use vents to control heat of grill. 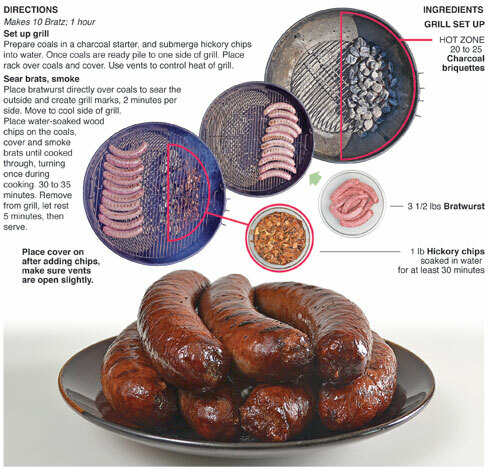 Place bratwurst directly over coals to sear the outside and create grill marks, 2 minutes per side. Move to cool side of grill. Place water-soaked wood chips on the coals, cover and smoke brats until cooked through, turning once during cooking. 30 to 35 minutes. Remove from grill, let rest 5 minutes, then serve.